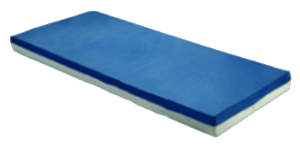 Basic Foam Mattress is designed to aid in pressure ulcer prevention in the home-care setting. It is cut from a single layer of high-quality, combustion-modified foam in a fluid-proof, nylon and vinyl cover. 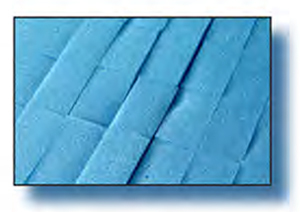 The cross-cut top surface is segmented in three distinct zones. Folded and boxed to save freight and storage. Primarily used in aggressive treatment of pressure ulcers. Weight capacity: 350lbs. This item cannot be returned or exchanged once they are opened due to hygienic reasons. Three-tier, zoned design and all-new features makes it our finest offering. 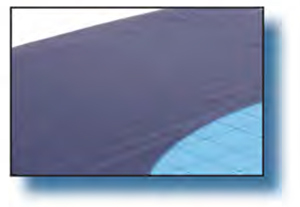 Cross-cut top surface creates 800 individual cells in 3 zones for enhanced immersion and pressure redistribution. Fluid-proof, wipe-clean coated nylon cover, with hidden bottom zipper for easier, more through cleaning. Specifically designed for the needs of the at-home patient at risk for skin breakdown. This foam mattress is cut from a single 5" layer of high-quality foam in a fluid resistant, wipe-clean nylon and vinyl cover. Folded and boxed for convenient shipping, storage, and delivery. The bacteria-static top fabric is fire resistant, fluid proof, tear resistant, cleanable, and replaceable. The pleated design allows full integration with the mattress's Geo-Matt style shear-relieving surface while minimizing hammocking. The cross-cut cells individually conform to the patient's curves to assist in pressure redistribution. A great choice for heavier home care patients. An economical yet effective option for long term care residents. Hidden Zipper Design For easier, more thorough cleaning and superior infection control. 800 individually responsive cells in distinct head, torso, and foot zones enhance therapeutic support and comfort.